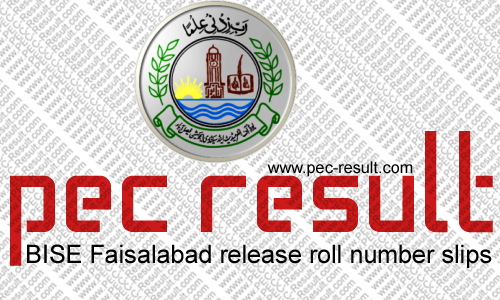 The board of intermediate and secondary education, Faisalabad has uploaded the roll number slips of all the registered candidates on the official website for them to download as the board is all set to conduct the examination of matric classes. The examinations starting from march 1 and for that the total number of candidates who have aspired for the examinations are 124,369. All the roll number slips of these students are now available on the website of the Board of intermediate and secondary education, Faisalabad. Malik Zafar Iqbal, who is the Controller examinations of BISE Faisalabad, has told that this is great move. Now the students who are busy in the preparation of the examinations will not have to waste a day to get to their schools and grab their roll number slips from there. He said that we have uploaded them on the website and they have to download and print their own roll number slips. He added that we have dispatched the roll number slips to all the candidates to the addresses they have written in the admission forms while registration. He said that the total numbers of girl students who are appearing in the examinations are 58,402 and the number of boys participating in the examinations is 65,697. The total number of the examination centeres is 500 which are all set up in the regions of Faisalabad, Toba Tek Singh, Jhanf and Chiniot region. He said the total of 510 superintendents have been appointed along with 4500 of total examination staff who will ensure the smooth examinations.